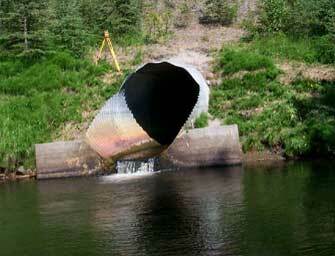 ADF&G works with partners to replace or remove barriers to fish passage throughout the state. 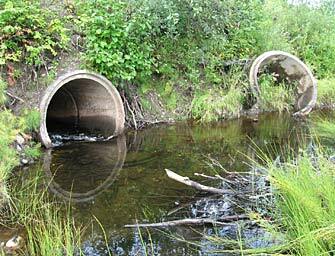 Culverts identified as barriers during ADF&G Fish Passage Assessment Program are removed and replaced with bridges or with fish friendly culverts. 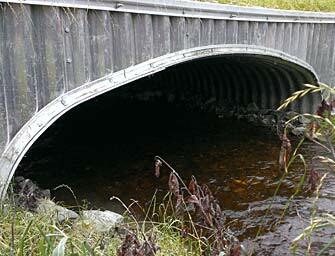 Fish-friendly, or stream simulation culverts, are constructed so that the channel inside the culvert is virtually indistinguishable to the natural stream channel up and downstream. 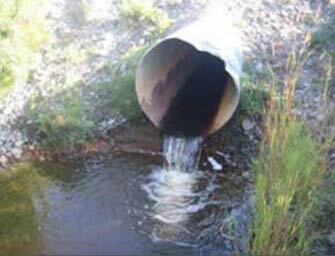 This allows fish and other aquatic organisms to freely pass up and downstream. 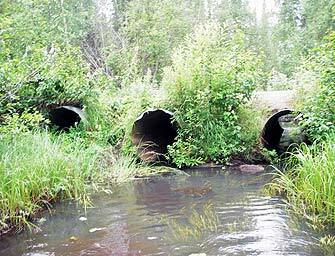 To date the Alaska Department of Fish and Game Fish Passage Improvement Program and its partners have carried out 33 culvert replacement project, providing access to 78 river miles and 1,963 acres of lake habitat. This work has been carried out in partnerships with numerous resource agencies and land owners. Some of these projects are highlighted below. Goose Creek runs through the Goose Bay State Game Refuge and supports Chinook and coho salmon. 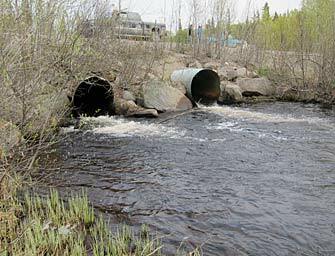 The culvert at Cameo Road was replaced in 2013 in cooperation with the Mat-Su Borough, the Alaska Sustainable Salmon Fund and the U.S. Fish and Wildlife Service. The new stream simulation culvert provides unimpeded access to 10.12 miles of stream habitat and 400 acres of lake habitat as well as extensive wetlands throughout the watershed. Sawyer Creek (aka Buddy Creek) is the largest tributary to Montana Creek and supports spawning populations of Chinook, coho and pink salmon as well as rainbow trout. 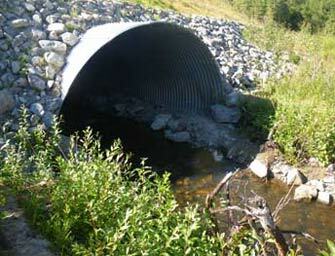 The undersized and perched existing culvert was replaced in 2013 in cooperation with the Mat-Su Borough, the Alaska Sustainable Salmon Fund and the U.S. Fish and Wildlife Service. The new stream simulation culvert provides unimpeded access to the entire watershed upstream of Montana Creek Rd, at least 4.38 stream miles. And additional barrier on Sawyer Creek will be replaced in 2015. Old Tyonek Creek supports Chinook, coho and pink salmon as well as eulachon and is an important subsistence fishery for residents of Tyonek. 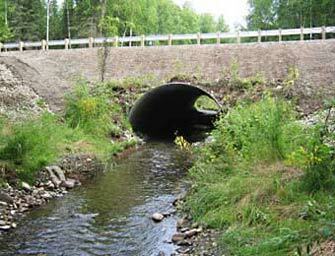 The existing undersized and perched culvert, installed in the 90s after a large flood, was replaced with a fish friendly stream simulation culvert in 2014. This project was carried out in cooperation with the Native Village of Tyonek, the Tyonek Native Corporation, the National Resource Conservation Council, the Tyonek Resource Conservation District and the U.S. Fish and Wildlife Service. Sunshine Creek is a tributary to the Susitna River and only crosses one thoroughfare, the Alaska Railroad. It supports coho, Chinook and sockeye salmon. 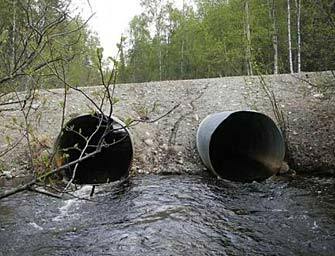 The existing culvert was very undersized relative to the creek and installed at a steep angle creating high velocities that were difficult for fish to pass. 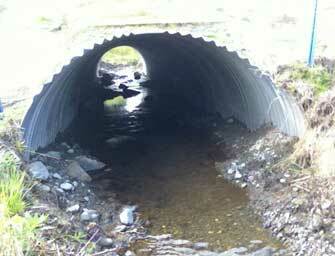 The narrow opening of the culvert also created an easy place for bears to catch adult salmon moving upstream to spawn. 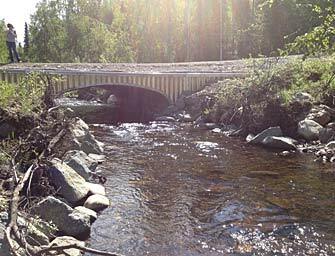 In 2012 the culvert was removed and replaced by a bridge and the downstream channel was restored to its natural width and depth. AADF&G partnered with the Alaska Sustainable Salmon Fund and the Alaska Railroad to carry out this project. Coal Creek, Kalifornsky Beach Road, Kasilof, Alaska. 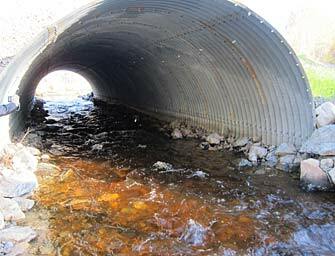 An undersized and perched culvert was replaced with an 18 foot diameter embedded stream simulation culvert that provides passage for fish and mammals. Partners include the Alaska Department of Transportation and Public Facilities, the U.S. Fish and Wildlife Service and the Kenai Watershed Forum. Coho and pink salmon spawn and rear in Coal Creek, a tributary to the Kasilof River. 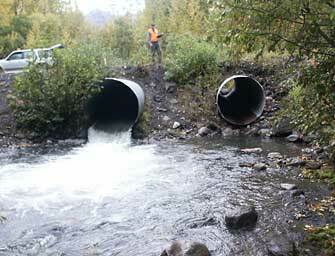 Stariski Creek Tributary at Tall Tree Road, Nikolaevsk, Alaska before and after replacement with a fish-friendly culvert in 2011. Partners include the Kenai Peninsula Borough and Kenai Watershed Forum. Coho salmon and Dolly Varden trout use this stream. Caswell Creek tributary at Hidden Hills Road, shown before and immediately after replacement a fish-friendly culvert in the summer of 2012. Partners on this project include the Matanuska-Susitna Borough and the U.S. Fish and Wildlife Service. Coho salmon use this creek for spawning and rearing and an adult salmon was observed upstream of the culvert three months after replacement. Salmon had not previously been recorded upstream of the road. 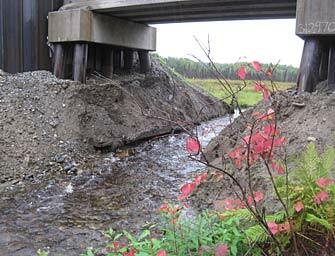 Eska Creek at Jonesville Mine Road in Sutton, before and after replacement in 2011. 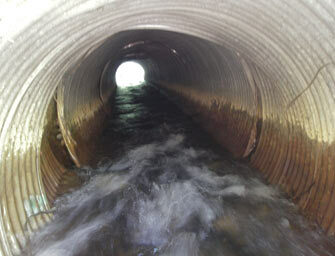 The old culverts were undersized and perched at the outlet preventing juvenile fish from accessing upstream habitat. 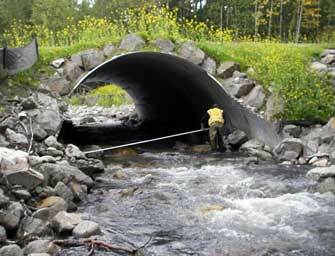 Coho and Chinook salmon use Eska Creek for spawning and rearing. Eska Creek is a tributary of the Matanuska River.